If you paid less than 1 cent per gallon of gas, join the "Pumpus Maximus, Pig Points Hall of Fame." You'll receive a bonus of 25 cents per gallon of gas, up to 15 gallons! Find more information on the Pig Points Program here. A Digital Photo Is Required! 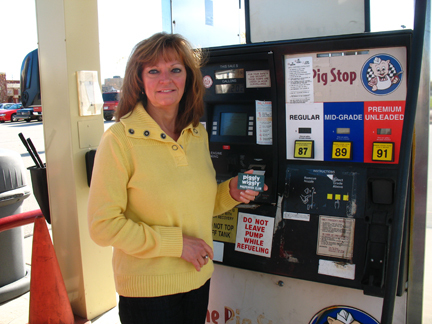 Please take your picture at the pump while you proudly display your Piggly Wiggly Rewards Card. Also, the picture should be more of an upper body shot, see the picture as an example. Pictures submitted may be used in other advertising materials such as our weekly flyers, posters, mailers, and of course, on our website. All photos are subject to cropping and color adjustments.